Many of you may have seen Samsung Galaxy S5 and may got amazed by its one feature called – Air call Accept i.e Answering phone call without touching the screen just using gesture or just taking it near to ear . Now you can install this amazing feature in your Android smartphone too without the need of too expensive Samsung Galaxy S5. Here is the amazing on Air call Answer in any phone . Air Call-Accept is a free app available in the Play Store that lets you wave over your phone to answer an incoming call, just like Galaxy S5, on any Android smartphone. Air Call-Accept depends on the proximity sensor that has become common in most of devices. Android phones do not contain that special infrared sensor thus your mobile need a proximity sensor. 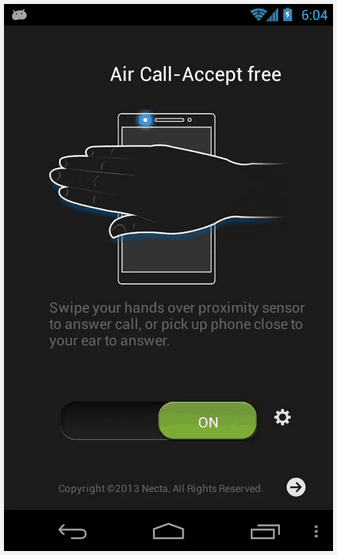 > Now your app is ready , thus whenever you will get a call all you need is to wave your hand over the proximity sensor area and your phone should pick up the gesture.